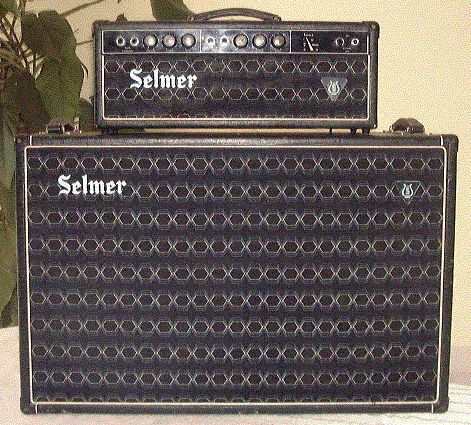 Plain black became the fashionable colour for amplifier bodies in the mid-sixties, and Selmer were maybe a little slow in following first Vox and later Watkins by finally dropping the two-tone coverings. Unfortunately it was so mandatory to have a black amp - the old two-tone coverings by then being considered very old-fashioned - that many people had their older amps re-covered in black, or if they couldn't afford that resorted to a can of black paint; usually the very devil to get off now that tastes have gone full circle. Often the post croc-skin Selmers are referred to as "ugly", but this is rather unfair as they they are no less attractive than the amplifiers made at the time by other UK manufacturers. Generally the changes were only cosmetic and not to the circuitry of the amplifier, so owning one of these "unfashionable" amplifiers is a bargain way to enjoy the Selmer sound. At this point though, it seems that Selmer made a quite radical revision of their range of amplifiers. It would seem that most of the range of croc-skin amplifiers were discontinued at or before the end of the croc-skin coverings era, certainly most of the smaller amps, though some model names continued onto new solid-state amps. Around this time, Selmer introduced a new ancillary logo in the shape of a lyre, which is to be seen on many of the black-covered amplifiers. As Selmer are nowadays part of the Steinway Company, whose logo is a similar lyre shape, it may well be that the acquisition took place at that time. This section is perhaps the least well-documented of the information we have tried to present, as Selmer continued to sell many different models of amplifiers until the end of the 1970's and possibly beyond. We have included in the linked pages to this one, details of the amplifiers that we have catalogue entries for from the late 1960's and early 1970's, model by model, and hope that visitors will help fill in the gaps by sending us more details. Black control panels, black plastic knobs, blue-on-black patterned grill-cloth (covering the lower half of amp heads). Light blue surface-mounted Selmer logo and sometimes also lyre logo. Black & silver (aluminium) control panel, aluminium knobs, patterned black grill-cloth (various styles). Printed separate Selmer and lyre logos. Brushed aluminium control panel (covering the whole front of amp heads), aluminium knobs, patterned black grill-cloth (various styles). Printed combined Selmer/lyre logo. It should be noted that Selmer seemed to change cosmetic features gradually rather than in one fell swoop, so finding amps which fall somewhere between the above styles is not uncommon.